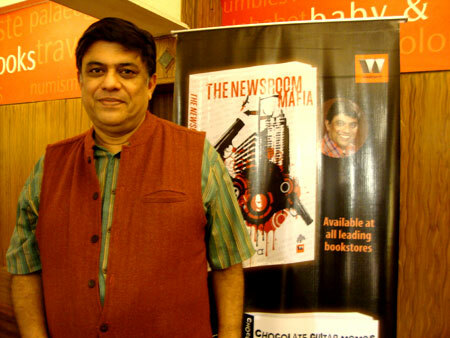 Oswald Pereira at the launch of The Newsroom Mafia in Kolkata. I’ve just finished reading The Newsroom Mafia and I loved it. Can you tell us a little about the book? So far journalists have been pointing fingers at the establishment and writing about corrupt police officers, politicians, and bureaucrats. Journalists are supposed to be watchdogs of democracy. They need to be ethical, full of honesty and integrity. But when you are in the profession, you know that all this is not really true. I thought it was time that someone took an honest, close look at the profession and wrote the inside story. Quite frankly, I was quite aghast at how some of my colleagues came out with great stories or scoops as they would like to call them, while brushing under the carpet their own unholy alliances. The Newsroom Mafia happens to be the first Indian novel to describe such alliances that a section of the media strikes with the mafia and the government. It’s all like one happy family and the outside world seems none the wiser. I set out to write a tell-all, non-fiction book on journalism, after spending more than three decades in the profession, quite disappointed with how my peers and superiors conducted themselves. In journalism here, we have small time and big time ‘racketeers’. The small time racketeers go and collect gifts at various lunch press conferences and evening cocktails, and churn out news briefs for a price. The big time racketeers are on the payroll of all manner of ‘Lords’ from the crime world and the corporate world. They are the ones who deliver scoops. There’s a price for printing a story, but sometime the price for not printing a story is higher. I recall as a business journalist how I was about to hit the ‘send’ button for my story when I got a frantic call from my source. He pleaded that I kill the story because the company that I was writing about had learnt that he was my source. “But I haven’t revealed you as the source to anyone,” I told him. “Your boss did. He apparently heard our conversation and heard you mention my name,” he said. “Someone from the company has already called me and threatened me,” he said. “They didn’t bother to hide the fact that your boss had revealed me as the source,” he added. The company was and still is one of India’s top companies. My boss, indeed, was on the payroll of that company and collected a big price for ensuring that the story was not printed. I know of not only crime journalists, but also journalists writing on entertainment and business making a killing. Editors are no less guilty. It was sad to see my colleague at a top publication sacked with immediate effect because he left out a hospital from a feature article despite the editor directing him to include it prominently in the writeup. I had started to write a tell-all, but as I proceeded a story cropped up and I began following the flow. It was quite fascinating to see the characters come alive from some inner part of my mind. When the Don came into my story, I tried to shove him aside; but he kept popping up and soon became larger than life. My characters were calling the shots. I was the mere scribe writing their story. It was neither my intention to write fiction nor to write a thriller. But here I am with my work that I really like. The book is a novel, but it seems to parallel some real events. 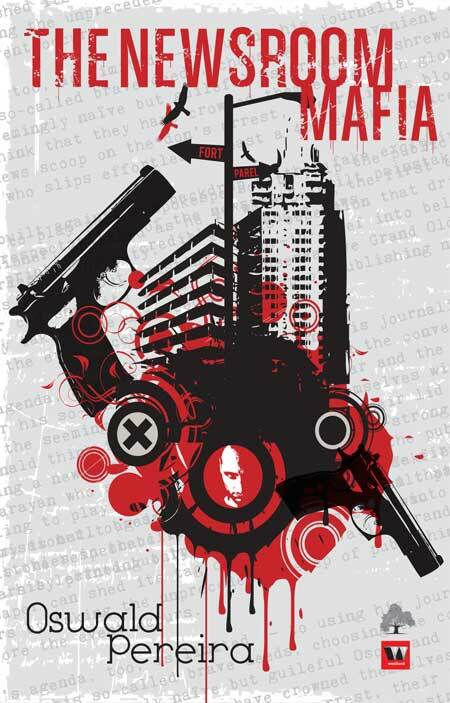 The Newsroom Mafia book cover. Was much of the book inspired by actual events? Ronald, you’ll get me into real trouble with this question. But I’ll be truthful. The novel is both real and unreal. It’s real, because the sort of things described in the novel can happen, given that it’s not too difficult to plant news in the media… some gullible journalists get conned into believing their so-called sources and swallow the stories hook, line, and sinker (if I were to use a cliché). But the smart ones use the plants to their great advantage. For them a story is a deal, like a good business proposition. That’s the real part of the novel. But the entire story is unreal—the incidents in the novel never really happened; it’s a figment of my imagination. I also imagined the characters, though many journalists have told me that they can identify them as real. Yes, there’s a growing culture of planted news and the way the media is manipulated or chooses to be manipulated, which would give one the impression that news stories appearing in the media may be doctored, blurring the line between fact and fiction. This reality has been highlighted in the novel. This is what has given observers like yourself the impression that the novel seems to parallel some real events and that much of the book was inspired by actual events. I would say both yes and no to that and leave it at that without further comment. I know you’ve spent much of your career as a journalist. Can you describe how your experience in that field has prepared and/or inspired you to write this book? My experiences as a journalist have been a great boon. I’ve written [the novel] from an insider’s perspective. The characters, too, seem so real because this is typically how corrupt journalists would behave. I’ve had senior police officers threatening that they would arrest a colleague for being hand-in-gloves with the underworld. But they never dared do it as they were scared to act because of the fallout of the arrest or government officials never gave them the sanction for arrest, because they may have been part of the nexus. I’ve read there has been some interest in turning the book into a film. 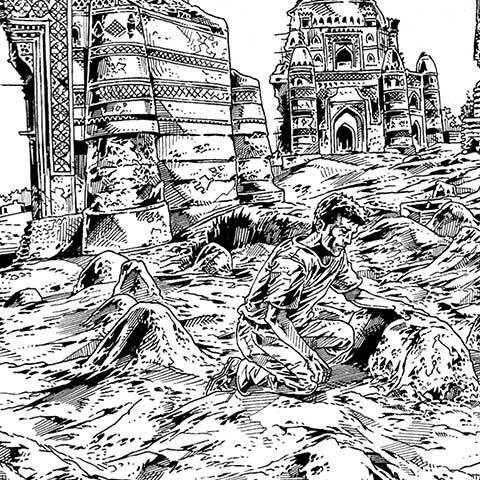 Yes, there’s been open interest about making the novel into a film. At the book launch in Mumbai, where actors and filmmakers were on the panel, they declared that The Newsroom Mafia was a book fit to be made into a movie. One of the panelists took a couple of copies to give out to producers and vowed that he would play a lead role if he succeeded in convincing a filmmaker. God willing, the book will be made into a film. I have no doubt that the book, acknowledged as a racy thriller, can be turned into a great screenplay. What’s your next project? Will you keep in the tradition of The Newsroom Mafia, with another political thriller in the world of journalism? My next project will be another novel on journalism. It’s inside me but there’s no specific plan or plot, though the characters keep knocking inside my head now and then. Like The Newsroom Mafia, I’ll go with the flow and see where the characters take the story and the book! Ronald Malfi is the award-winning author of the novels 'Floating Staircase', 'Snow', 'The Canyon of Souls', 'Shamrock Alley', and several others. Most recognised for his haunting literary style and memorable characters, Malfi's dark fiction has gained acceptance among readers of all genres. He currently lives along the Chesapeake Bay where he is at work on his next book. I think you should have spaced out these interviews over a week or so. Both the writers interviewing each other at the same time does not seem that serendipitous to me.